Puerto Madryn is known worldwide as the capital of scuba diving in Argentina. The crystal clear waters of the Golfo Nuevo and the great diversity of the wildlife thriving in its underwater parks are a perfect combination to make this Patagonian site the means of access to the submarine Patagonian adventure. ABRAMAR BUCEO guides you through unforgettable life experiences and helps you explore your diving skills both in natural and artificial reefs, which offer a wide range of possibilities for beginners as well as for experienced divers. Las Piedras beach is located north of the Luis Piedrabuena pier and, 600 m (1968 ft) from the shore, there is a natural reef park that bears the same name. The seabed there is rocky and sandy, there are long underwater shoals and the average depth is five meters (16 ft). When the tide rises, the maximum depth reaches 11 m (36 ft) and when the tide goes out, it ranges between 3.5 and 4 m (11-13 ft). Visits to these two wrecks are usually included in a single trip as they both lie very close to each other, on both sides of the Almirante Storni pier. The Jorge Antonio is a fishing vessel that fortuitously sank during a storm in December, 1991. The Kouturiaris vessel also sank accidentally in the 70´s after she caught fire and was fully destroyed. She is 60 m (196 ft) long, she has completely keeled over her side and now rests over her left side. The Río de Oro is a wooden schooner of 25 m (82 ft) long that sunk over 60 years ago. As the ship is sitting on a silty bottom, it is extremely important to have a good buoyancy control in order not to reduce visibility. The shipwreck is about 400 m (1312 ft) from the far side of the Piedra Buena pier, the maximum depth is 18 m (59 ft) and the minimum depth is 13 m (42 ft). Her prow and stern are decorated with elaborate wooden carving. Emma is a three-masted steel and wooden steam full-rigged schooner that sank off the coast of the city of Puerto Madryn on January 20th, 1947. This schooner was one of the vessels in Sir Shacklenton’s fleet, in the explorer’s first expedition to the Antarctica, at the beginning of the 20th century. It is possible to see one of her engines, the keel and the winch. At present, this wreck is considered to be of archeological importance. The keel can be observed, as it is upside down and buried at the bottom. Parque Profundo, the first artificial park in the area, was created around this shipwreck. Its depth is around 17 m (55 ft). On December 30th, 1999, the local community purposely sank a coffer containing messages written by all the neighbors and addressed to the 2100’s generation. This coffer will be opened on that year for the first time. Besides, there is a plastic visiting book for visitors to leave their signature and it is a tradition to ask every diver to go down with an object, as a testimony of his visit, and exchange it for the one left in the stone box by the previous diver. Testimonies, as they are called, can be very different objects. In order to dive in the area, it is necessary to be an experienced diver as the depth there is up to 30 m (98 ft). It is located in front of Puerto Madryn’s beaches and its average depth is 8 m (26 ft). It is an artificial reef, comprised of little wrecks, among which there are cars, a boiler, the structure of a little wreck (El Atlantis), a light aircraft, a sculpture called El Pastor de los Abismos, some small boats, etc. All those items were deliberately sunk to create an environment where divers can find species of marine reef fauna as well as the ones living in the sandy bottom, which constitute a unique characteristic of this park. This place is ideal for beginners and diving baptisms as it provides divers with one or more support platforms during a large part of the year. The Albatros is a 30 m (98 ft) long fishing vessel that lies at a depth ranging from 15 m (49 ft) and 24 m (78 ft). 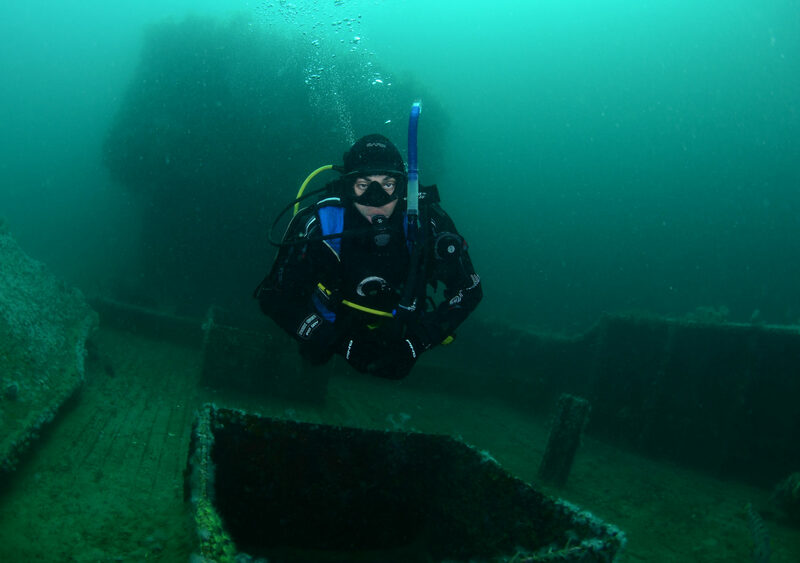 In September, 1998, this vessel was intentionally sunk to create a recreational dive site. The marine fauna and flora have found an excellent place to develop there and they are continuously flourishing. Advanced diving skills are required for this site. The Antonio Miralles, a 70 m (229 ft) long vessel, was sunk in March, 2004. It has large inner spaces which allow for a safe penetration into her bridge and engine room. The vessel is very well prepared and offers an opportunity for divers to navigate through various compartments. Sea life is thriving there, and a great diversity of marine life may be observed. It can be reached in a 15-minute boat ride and has a maximum depth of 28 m (91 ft) at high tide and 20 m (65 ft) at low tide. It is located at one end of the city of Puerto Madryn. The dive site can be accessed from the shore, near the Monument to the Tehuelche Indians. On a rocky-sandy bottom with small underwater shoals, about 300 m (984 ft) away from the shore, some groupers, octopuses, Turkish fish and starfish can be seen. It is a great dive spot for beginners and for snorkeling. Divers can go all along the whole area.